One of the first things you’ll notice strolling around Edinburgh is the collection of private schools that seem to have dropped out of context and out of the sky. 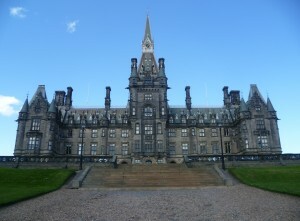 Pudgily gothic Fettes. The ersatz Red Square on the Thames of Stewart’s-Melville. Last week, I was wandering along Lauriston Place, heading in a roundabout sort of way towards Cockburn Street to see if the t-shirt shop had replenished its stock of John and Yokos. Heading east along the street, I was distracted from George Heriot’s School looming from an Edinburghian distance by the sounds of Kermode and Mayo’s Film Review on BBC Radio Five Live.